The Embraer EMB-505 Phenom 300 is a light jet aircraft developed by the Brazilian aerospace manufacturer Embraer. It can carry up to 11 occupants. Embraer began designing the Phenom 300 after finding that potential customers of the Phenom 100 would also like a bigger aircraft. It was a new design with the aim of allowing operation to smaller airports such as London City and Telluride Regional Airport. It first flew on 29 April 2008, and received its type certification on 3 December 2009. On 29 December 2009 Embraer delivered the first Phenom 300 to Executive Flight Services at the company's headquarters at São José dos Campos, Brazil. The Phenom 300 is a twin-engined cantilever monoplane with a low-positioned, swept wings. It has a horizontal stabiliser in a T-tail configuration and a retractable tricycle landing gear. It has two rear-pylon-mounted Pratt & Whitney Canada PW535E turbofan engines. The enclosed cabin has room for nine passengers and a two-pilot crew; during single-pilot operation an additional passenger can be carried. Access to the cockpit and cabin is via an airstair on the left-hand side. Its structural life is 28,000 flight cycles or 35,000 hours. It is built of 18% composite materials; it has winglets, but not thrust reversers. The Phenom 300 has single-point refueling and an externally serviced private rear lavatory. The 400th was delivered in March 2017. The Phenom 300 became the most delivered business jet with 60 units in 2013. This was also the case in 2014 and 2015. All Phenom assembly will be shifted to the Melbourne, Florida line from July 2016. The facility will be able to assemble up to 96 Phenoms and 72 Embraer Legacy 450/Embraer Legacy 500 annually. More than 170 Phenom jets have been produced at the site up to June 2016, mainly for the US market. In March 2019, Embraer delivered the 500th Phenom 300, claiming more than half of the light jet market share since 2012. It is operated in over 30 countries, and carried 2.5 million passengers in 600,000 flights and 800,000 hours. On 6 August 2012, Dalia Air Flight 211 (CN-MBR) overran the runway on landing at Altenrhein Airport; all three on board survived, but the aircraft was substantially damaged and was written off. On September 19, 2014, at about 8:47am, N322QS, impacted a ditch after the airplane departed the end of the runway while landing at Lone Star Executive Airport (CXO) in Conroe, Texas. There were no injuries but the airplane was substantially damaged. The flight was a repositioning flight operated by NetJets Inc. The first officer's use of the emergency brake system during landing was found to be the cause by the NTSB. On 31 July 2015, an Embraer Phenom 300 crashed into a car auction site while trying to land at Blackbushe Airport, UK. The cause of the accident was found to be pilot error. All 4 persons on board the Saudi-registered private jet died in the crash and subsequent fire. ^ Murdo Morrison (12 Oct 2018). "NBAA: Business jet designs that changed the industry". FlightGlobal. ^ a b "Embraer delivers the 500th Phenom 300 series aircraft, the most successful business jet of the decade" (Press release). Embraer. March 25, 2019. ^ "Purchase Planning Handbook" (PDF). Business & Commercial Aviation. Aviation Week Network. May 2018. ^ "News Breaks: Embraer Delivers First Phenom 300 Light Jet". Aviation Week. McGraw-Hill: 18. January 11, 2010. ^ Morrison, Murdo (21 April 2010). "FlairJet to add Europe's first Embraer Phenom 300 to fleet of two Embraer Phenom 100s". London: Flightglobal. Retrieved 26 November 2010. ^ "Embraer and Flight Options sign for 100 Phenom 300 Jets" (Press release). São José dos Campos: Embraer. 3 December 2007. ^ "JetSuite Adds Two Embraer Phenom 300s to its Growing Fleet". Private Jet Card Comparisons. 10 October 2017. ^ "Embraer delivers 400th Phenom 300 to Naples, Florida Charter Company EliteJets.com" (Press release). Embraer. March 31, 2017. ^ Sarsfield, Kate (29 December 2014). "NetJets converts Phenom 300 options into firm orders". Flightglobal. Retrieved 30 December 2014. ^ "Embraer Phenom 300 is most-delivered business jet in the world for the third consecutive year" (Press release). Embraer. 23 February 2016. ^ Chad Trautvetter (June 2, 2016). "Embraer Starts Legacy 450/500 Production in U.S." Aviation International News. ^ "Embraer opens Legacy final assembly facility in Melbourne". Flight International. 8 June 2016. ^ "2017 Annual Report" (PDF). General Aviation Manufacturers Association. p. 17. Retrieved 2018-04-10. ^ Trautvetter, Chad (9 August 2014). "Prodigy Touch Upgrades Embraer Phenom 300 Cockpits". AINonline. Retrieved 12 August 2015. ^ Accident description for CN-MBR at the Aviation Safety Network. Retrieved on 27 July 2016. ^ "Blackbushe Airport: Four dead in car auction site plane crash". BBC. 31 July 2015. Retrieved 31 July 2015. 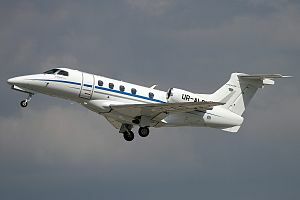 Wikimedia Commons has media related to Embraer Phenom 300. This page was last edited on 27 March 2019, at 06:30 (UTC).